When a White House invitation to the first U.S.-Africa Leaders Summit showed up in his email last year, Emory senior Kwadwo Sarpong didn’t give it much thought. “I honestly thought it was some kind of a joke,” says Sarpong, who will graduate from Emory College of Arts and Sciences on May 11 with a degree in neuroscience and behavioral biology (NBB). But when a second invitation soon followed, Sarpong took notice. That’s how Sarpong, who is from Ghana, found himself attending an event with top African officials, international leaders and U.S. cabinet members, where he represented the African Research Academies for Women (ARA-W), an organization that he co-founded to nurture the interests of aspiring female scientists in Africa by providing hands-on experience in research laboratories. For Sarpong, a trip to the White House was both exciting and humbling — extraordinary validation for a young scholar who only a few years ago was still dreaming of the day that he could pursue an American education. Today, Sarpong prepares to graduate from Emory as the CEO of a nonprofit that has already won support from the Clinton Global Initiative, which brings together leaders and experts in different fields to explore innovative solutions to international problems. Sarpong arrived in Atlanta in 2009 with one goal: education. Growing up in Ghana, the youngest of four boys, he was deeply aware of shortcomings within the nation’s healthcare system. When one of his brothers became ill with paralytic polio, he recalls that some blamed it on evil spirits. Stricken with severe fevers while growing up, Sarpong spent considerable time in hospitals himself, an experience that would feed a budding interest in medicine. During his first year of studies at the University of Ghana, Sarpong was thrilled to learn he’d “won a green card” and the chance to travel to the U.S.
As friends back in Ghana were preparing to graduate from college, Sarpong studied their Facebook photos. While their lives were moving forward, his seemed stuck. In time, he began taking classes in chemistry at Georgia Perimeter College. Motivated by his brother’s experience with polio, “I became very interested in neuroscience,” he says. With the help of Emory’s Initiative to Maximize Student Development (IMSD) — a program funded by the National Institutes of Health (NIH) to expand scientific workforce diversity — Sarpong arrived as a transfer student in Fall 2013. Last summer, he was accepted into Emory’s Summer Undergraduate Research Experience (SURE) program, which allows undergraduate students to conduct full-time research under the mentorship of a principal investigator. With an academic stipend and housing, participants can focus on research training, professional development and biomedical research ethics, developing scientific skills critical to careers. To Sarpong, it was life-changing. “The fact that you could engage in real research supported by these resources was incredible,” he recalls. Talking about his experiences one day with a friend who had graduated from the University of Ghana, he was shocked to learn that she had taken a job as a bank teller — the only position she could find. “There is nothing here for women in science,” she told him. Sarpong, who is majoring in neuroscience and behavioral biology, felt compelled to do something about the opportunity gap that exists in Ghana — and much of the developing world — between men and women in the sciences. 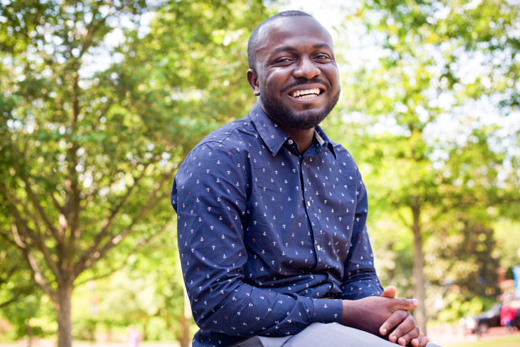 With the support of his friend, Shadrack Osei Frimpong, a senior at the University of Pennsylvania, Sarpong decided to launch an intiative that would help nurture girls in the sciences, exposing them to the kind of supportive research experience he’d found at Emory. Their nonprofit is targeting a pressing need — gender inequities in the sciences pose real barriers, especially in developing countries, says Emory biology professor Pat Marsteller, who has worked closely with Sarpong as director of the Emory College Center for Science Education, which oversees the SURE program. In the cell biology laboratory where Sarpong had worked at Emory, his supervisor recalls him sharing stories about inequities that hinder women in science in Ghana, and how other female students from around the world had nodded in recognition. “Kojo is humble and very shy in a lot of ways, but what he’s doing is interesting and important,” says Arthur English, a neuroscientist and professor of cell biology in the Emory School of Medicine. Last summer marked the inaugural class of ARA-W college students, five young women who were given the opportunity to conduct supervised research in STEM fields at the University of Ghana’s Noguchi Memorial Institute for Medical Research. Applications are already coming in for this year’s program, which they hope to expand into Nigeria. The program sponsors women in a research setting for 8 to 10 weeks, then helps match them with mentors in both their home country and the US to help nurture their interest in the sciences, Sarpong explains. For budding young scientists, “that hands-on experience is absolutely essential,” notes Marsteller, who plans to join a faculty advisory board for ARA-W.
Over the past two years, ARA-W has twice been accepted into the Clinton Global Initiative University, a conference that brings together students, specialized experts, college representatives and celebrities to discuss innovative solutions to global challenges. At Emory, Sarpong says he’s found both inspiration and practical support for the organization. Materials he used in the SURE program have been adapted for use in ARA-W. In addition, a number of Emory students and faculty now serve on advisory boards and committees for the nonprofit. Although Sarpong will begin studies this fall at the Icahn School of Medicine at Mt. Sinai in New York City as an NIH Post-Baccalaureate Research Education Program (PREP) MD/PhD scholar, he plans to spend time this summer continuing work on the ARA-W.
With the involvement and support of Emory students and faculty, he’s confident that ARA-W will continue to grow. “Bringing these people together toward a common goal has been the most enriching experience in my college career,” says Sarpong.